Excitement rushed through his body as the last swimmer of the 400 freestyle relay touched the wall and senior Sam Reinhart looked at the clock: a new fastest time for the relay and a tie with Sioux City for first place. On Saturday, Feb. 3 in Fort Dodge, the men’s swim team took on seven other teams, receiving the district title, the first since 2012. Going into the meet, the team did not have many expectations, except to qualify as many members as they could for State. “Honestly, I didn’t even think about what place we may get at the meet. My only focus was getting as many of my swimmers to State as possible. The fact that we tied for first was just a nice cap onto the meet,”head coach Jordan Wessels said. And the team definitely qualified. They doubled the amount of state qualifying events compared to last year, and first followed. With much success this season, sophomore Dawson Bremner credits the improvements to Wessels. “Our team really persevered despite some adversity, and we all competed to the best of our abilities the whole meet. We co-won Districts and were able to qualify a respectable amount of swimmers for State, and the relays all qualified. Our hard work the whole season and an amazing coach to guide us got us to where we are now,” Bremner said. Senior Sam Reinhart also credits success to Wessels and touches on how the availability of a familiar face has helped the team adjust. “A lot of returning swimmers already knew Jordan from club swimming, so it was an easy transition to a new coach. Jordan is a lot more knowledgeable than other coaches we’ve had, and he’s young, so he understands what it is like to be in our position. 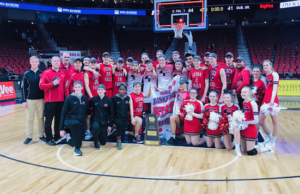 He’s a great coach, and we’ve already had a lot of success in his first season,” Reinart said. Wessels notes his nerves going into the season as a first year coach, and the success that he has brought. “I really didn’t have too many expectations right from the start. This was my first year coaching, and I was more nervous than anything. As the season progressed, that is when the expectations started to come about. One being getting a lot more swimmers to qualify for State,” Wessels said. Bremner also said he feels that Wessels’ experience as a CFHS swimmer has helped aim the team for success this season and the state meet ahead. “Jordan has really turned around the swim team in a matter of just one season. He was part of the iconic team that won three state titles in a row for Cedar Falls. He writes good workouts, explains our technique errors to us and gives us counsel on how to grow as athletes. He is also a good friend, and we all enjoy his company. He has brought Cedar Falls swimming back to somewhat what it used to be when he swam,” Bremner said. Wessels had much anticipation building up for the districts meet, and with much success the team plans to gear up for State. “Districts is where I was able to let out a sigh of relief. 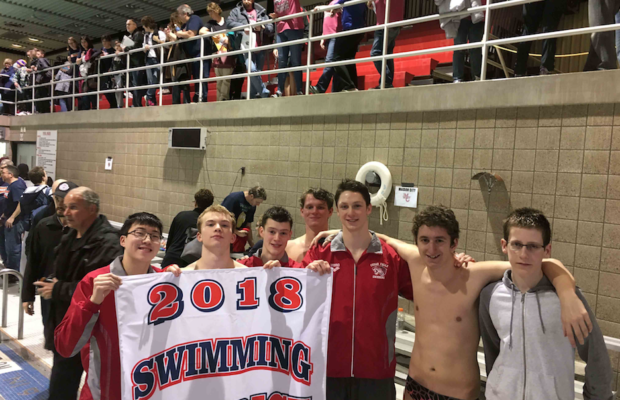 The whole season is just a lead up to this one meet and to have the majority of my swimmers post best times and have double the number make it to State felt great,” Wessels said. Going into State this upcoming weekend in Iowa City, the team has high hopes with its 400 freestyle relay seeded 6th and other events seeded in the top 20. “It would be great to gain a few places in the 200 medley relay and free relays and to possibly get top 5 in the 400 free relay. We are feeling somewhat optimistic considering some of our fastest swimmers were not rested going into the districts meet,” Bremner said. Reinart also said has a positive outlook for his final high school state meet.